A couple of years ago, a friend bought me a springform pan when I was getting into cooking. I'm pretty sure she just wanted me to make a cheesecake so we could eat it together, which I completely respect as a reason for choosing a gift. 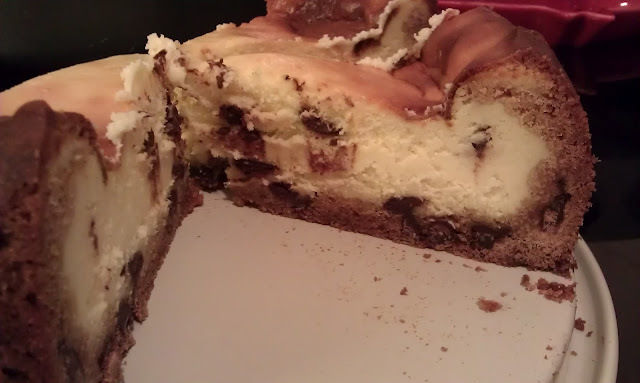 Once I had it, though, I realized a lot of cheesecake recipes seemed overly complicated. "Water bath" this and "adjust wire rack" that. It took me so long to read the directions, I finished a whole bottle of wine and woke up the next day, very thirsty in a house still devoid of cheesecake. When I saw this recipe on the Betty Croker website, I assumed it was going to end up like one of those soft, no-bake "cheesecake pie" attrocities that you'd find at Denny's - but quite the opposite. It's easy as all get out, and it yields a firm, true-to-form cheesecake without all of that fancy talk. It only takes about 15 minutes to throw together and an hour or so to bake, then you have the rest of that time for getting day drunk.